When my mom came home yesterday I got my Paranorman + Coraline BluRay :D I ordered it for Halloween and it came a bit late but whatever~ Me and my brother watched Coraline first, which I’ve already seen and it’s magical. And now we’re seeing Paranorman (which I’ve never seen before), it’s hilarious and I love it! The t-shirt(s ⬆⬇) is really big and comfy! I actually tweeted the picture above and Seether’s twitter account answered and retweeted it *I was a happy fangirl at that moment haha* I’m writing this pretty late and I don’t like to put up stuff in the evening so that’s why I scheduled it to publish in the morning… when I’m sleeping ehehe~ I’m trying to not spend too much money this month but I’ll definitely get Professor Layton and the Azran legacies! :D But that’s it *hnnn… hopefully, me and budgets don’t go together*. ♥ A few weeks ago I made an order with a preorder item at Jbox. I didn’t think that they would charge for it directly so I hadn’t transferred the money and that resulted in a 10-day-delay until I told them to go through with the order. The main order contains *dun-dun-dun* Puccho (in a few different flavors) and Pokemon things (one is candy)! Can’t wait until it gets here! The ones I’ve bought doesn’t look like the one’s in this picture though. The preorder item is an Evangelion tumbler. I like tumblers and these looked cool so I thought why not. I haven’t seen You Are (Not) Alone yet but I will when I get the chance! Can you guess which one I chose? The first one I’ll try will be Peace & Love & OPI. It looks gorgeous! KH 1.5 HD Remix releases this week but I ordered it from a site that doesn’t really care if you get it on the release date so I’ll probably get it next week. I’ve also paid to get two numbers of two of my favorite comics (that sentence, hope you get it haha) really cheap. Picked up a package from Cdon.com and one from Electroworld.se today. From Electroworld I got my preordered Disney Infinity starter pack (didn’t get the preorder bonus and I’m going to ask why). And Cdon had really good offers on games a few days ago. They had 20% off all games (preorders not included) and 3 for 2 on selected assortment! 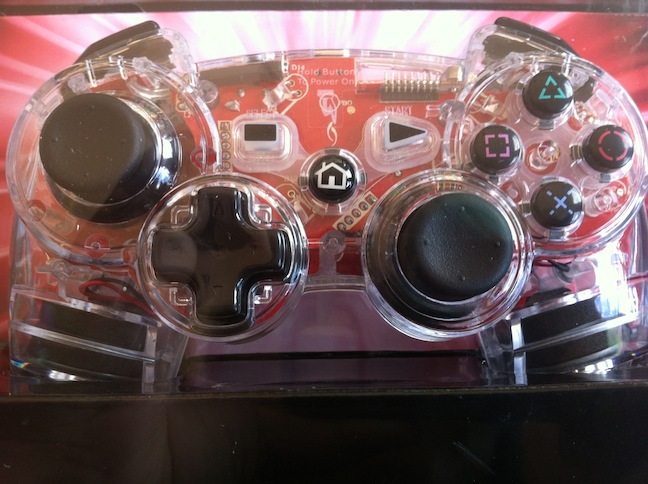 I got this Afterglow AP.2 wireless controller that’s see-through and it also has lights that you can have on all the time, off all the time or (what probably will be my favorite) have them light up when the controller vibrates! The Last Of Us, Mario & Luigi: DT and the controller was on the 3 for 2 offer. I didn’t pay anything for the 400 SEK controller~ c: Last but not least I got aaaaall the seasons of my favorite series ever (cat not included) :D It was 50% off but still expensive… but I couldn’t not get it since it’s been forever since I saw it and I love it QwQ Physical copies is the way I like it haha. I’ll try to blog more often (fo’ reals) but because we only have one computer and my brother has started to play LOL which gives me little time with it. But it should get better now since he starts school again (freakin’ 10th grade aah!). I’ve been waiting for this package from Jlist/box for about a month now because two items had to be restocked but now that it’s finally here I’m really happy I waited :D I’ll show you why! Seems like the little package went through customs just fine =w=b I was so exited when I opened it in the car! This was the first thing I saw. ★ UHA One Piece Puccho World. This one is to my brother! Aaaand that is all~ The Pokemon hard candy and the One Piece Puccho had to be restocked but it was worth the extra two weeks because they are delicious and the packaging is so pretty! I’m going to do more posts on the stuff I got ^__^b Showing off the Pokemon candy/Puccho and doing a post on the do-it-yourself candy-kit Majo Majo Neru Neru! I’m in need of a new pair of shoes (since I have a tendensy of destroying them on a regular basis :c) and since I saw a pair on Asos a couple of months ago, I decided to put them in my basket! Along with two maxi dresses and a pair of leggins. ORDERS ABOVE 800 SEK” offer on the Asos UK website. I don’t know how much you have to buy for in your currency but it’s probably the value of 80 GBP. Just a little update about the blog and general things I want to say! I made an Ask.fm account last night because I was so bored! you can see it on both Twitter (which is seen on the right) and Ask.fm! I don’t know if you’ve noticed but I thought that I would tell you anyway! I ordered two pairs yesterday and I’m really exited to get them. I’ll be reviewing them when they arrive! My Glossybox is late… I’ll be getting the March box in April *sob*. And I’m a little worried since I don’t get all my text because my phone don’t have a signal at home, I might miss my come-and-get-your-package-text! ;A; I really hope I get it tomorrow or so. I don’t know if you want me to make a post about something other than… makeup, haha. But feel free to comment below if you have a request! >w< I might scan my doodles tonight! They aren’t that many though. I hope you’ve been fine while I was gone! We didn’t have free Wifi on our hostel so being online all the time wasn’t an option. I arrived in Gothenburg at around 19.00 yesterday and the past five days was great! The weather wasn’t on our side but we made the best out of it. I took pictures everyday so I’m going to upload pictures from day one today and then upload the other ones when I have the time! The report (for the project) must be handed in on Wednesday and I haven’t started writing it… so I’ll have no time to blog (but I probably will anyway if I find a hole to do it >w<‘), so expect very little activity during the upcoming four days. I bought a lot of stuff while I was in Edinburgh. Most of my money was spent on food and necessities because I didn’t bring those in my bag but I was able to buy things I wanted anyway. Makeup~ I forgot to take a picture of the nail polishes I bought but I’m going to swatch them so it’s fine :3 I’ll review some of these when I have the time! Bought in HMV with a 30% discount on the CD and 40% on the DVD… aaaahwsome! Bought this cloth bag in Primark c: I payed a fifth of what I would’ve payed in Sweden *mind blown*. I love it~ I bought this t-shirt because of my twitter addiction (+ it’s so cute) and a tank top with a mickey mouse dollar-sign on it! Yesterday I got a mail notifier saying that I had a package to pick up~ So I picked it up today and as I suspected, it was my shoes! I ordered the ASOS Vancouver Flatforms with the black and white bird-pattern from their OUTLET Up to 70%-sale almost two weeks ago. It took 10 days for them to come from the UK to Sweden~ Which is totally fine with me, I’m not much of an “I want them fast”-type of girl. I’ll be happy if they just arrive in good condition! This model comes in five different colors: white, black, black/white birds, metallic blue and rose gold. This “color” is 100% textile on the outside, has a 50% polyurethane/50% textile lining socket and the sole is 100% rubber. The flatform is 7 cm. They are creeper-styled but with a pointed toe (and a more feminine-shaped flatform). I really like these shoes~ They are pretty and comfortable to walk in. I only walked in them a bit but they are already dirty-looking (sorry for that~). For close-ups it looks pretty bad but in real life it isn’t that noticeable! They are a bit taller than my old ones but aren’t harder to walk in. Speaking of old ones, I showed my Twitter followers this a few weeks ago and this is also the reason I bought a new pair: One day they just decided to split in two. I love these shoes but when I’ve bought a pair, I use them until they are torn to pieces so I wasn’t surprised. I bought them in the middle of last summer and used them everyday until today. I’m taking these with me to Scotland though. I won’t get the new shoes soft enough before the trip in three days and I really don’t want to have chafed feet with the amount of walking we’ll do in Edinburgh! You can still find these on the website. Only in size 8 though. If you’re looking for clothes I really recommend you to check out the sale, they have some pretty awesome deals. ^_^ They also ship worldwide! Over all it’s been a really good day! I saw this lamp in a store for a discounted price and my mom asked if I wanted it as a birthday gift! It feels like wood (but I’m pretty sure it’s not) and the lampshade is dark green. They had a lot of lamps in similar style but they were horses, statues ect. They were really cool but I decided to go with the kittens! My brother sold some games he didn’t want to keep and with the points, he’s going to get me two games I want. QwQ So happy! I just had my “birthday cake”! Tea-time with a pastry that mommy bought. I’ll make the real cake on Friday, the day before my party!